The Limpopo Department of Education (LDoE) has consistently been given extraordinary amounts of money and, time and time again, has failed to improve the state of education in the province with it. This year, in 2016, the budget increased by over 7% to R27.2 billion, the largest amount allocated to any department in Limpopo. This makes up almost half of the total provincial budget, according to the province’s MEC for Education, Ishmael Kgetjepe, who delivered his budget speech on Thursday last week. While this figure shows the provincial government’s commitment to education as one of the most important forces in addressing poverty in Limpopo, the state has continuously failed to deliver. This is partly because of the repeated and rapid changes in leadership within the past two years, making it difficult for any single person to be held accountable. In his 2015 budget the then acting MEC of Education Jerry Ndou announced with gusto the “whopping” amount that had been allocated, saying that “we have counted the cost and set our sails to reach the promised land”. It is not clear where the money allocated for public ordinary schools was spent last year. What is clear, however, to SECTION27, is that there is little if any improvement in the province’s schools we work in, and certainly no “sailing” to speak of. To add insult to injury, the LDoE is the only department in the province that remains under administration by the national government, and in 2015, was one of the worst performing in the country, with its grade 12 results declining by 7%. The latest budget does not sufficiently address the serious infrastructure failures in Limpopo schools. This includes a shortage of nearly 41,000 toilets, of which nearly 34,000 are pit latrines that still need to be replaced, a shortage of over 6,000 classrooms plus a further 4,600 grade R classrooms. Among these are schools that have been devastated infrastructurally by storms, roofs that were blown off by the wind years ago and have not yet been replaced, broken windows and cracked floors. The MEC, Kgetjepe, spoke of the Council for Scientific and Industrial Research’s (CSIR) assessment, which records many of these issues. 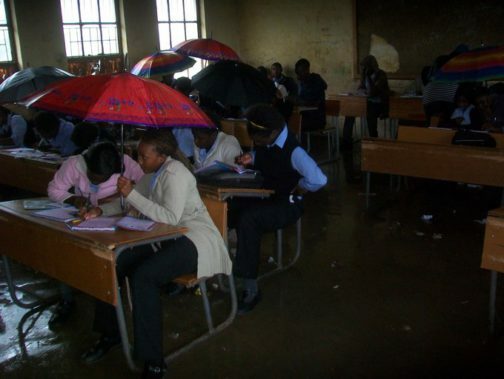 This would at least give us an idea of the conditions of all schools in the province so that the Department can urgently see to bringing them in line with the minimum infrastructure requirements of the national Norms and Standards for School Infrastructure, released at the end of November 2013. We have been anticipating the release of the CSIR audit report since 2012, and are told annually of its imminent finalisation. One of the LDoE’s biggest problems with accounting for the unrepaired damage and much-needed development is that it is missing a massive chunk of data relating to its own schools. The Limpopo Implementation Plan for the Norms and Standards for School Infrastructure, released in November 2015 shows that roughly 70% of data for school infrastructure in Limpopo is still “to be confirmed”. If the CSIR’s audit has been ongoing since 2012, it is difficult to see how the majority of information was not available to the LDoE to be used in this plan, and equally difficult to see how in the space of six months the missing data has been collected. The commitments made by the Department have not yet been translated into action, even for the most vulnerable of learners. A number of special schools for visually impaired learners illustrate this point particularly well. Firstly, at Rivoni School for the Blind in Limpopo, new facilities were promised by the LDoE in 2012 but it has yet to receive any new infrastructure, or any repairs and renovations to their existing and extremely unsafe premises. Secondly, at Setotolwane Secondary School for visually and hearing impaired learners, learners have been attacked by both humans and animals. The LDoE promised to relocate the school in 2009. The province has seen a number of schools shut down for weeks of this year in protest at the unacceptable infrastructure. The Department is not listening to its schools. For example, in June 2015, Homula Secondary School (in the Vhembe district) was damaged by a catastrophic fire. The school wrote to the Department asking that their infrastructure be repaired. Community members report that Department officials visited the school but, without offering any explanation, refused to examine the burnt infrastructure and only looked at the school toilets, which were not affected by the fire. Higher education prioritised over basic? In March 2016, at a meeting held by Treasury to get input from civil society on budgetary issues, we were alerted to the fact that R500-million was diverted from the national Department of Education’s budget for school infrastructure to cover the 0% increase in university fees for this year. While we fully support the students’ struggle for free education, it is unfathomable that the money be taken from school infrastructure. This will only further entrench inequalities in basic education that will continue to limit access to tertiary education to the wealthy minority of the country. It is clear that financial management needs to be urgently addressed as a priority of both the national and provincial government. Kgetjepe specifically committed to improving it throughout his speech and civil society must hold him to that. In the midst of mismanagement and a lack of financial accountability, there has been an obvious effort to improve special schools, for hearing and visually impaired learners in the province. This includes a plan to train 300 teachers to be able to teach learners with special needs, including 200 serving educators who will receive training in Braille and sign language. However, there is no real clarity around these programmes. It is not clear whether the programmes include training for teachers at full-service schools, or whether a full-service school programme in the province currently exists. What is clear is that there are not enough teachers for deaf and blind learners, and there will without a doubt be learners who do not have access to these special schools. Basic Education for All (BEFA) and SECTION27 has been monitoring textbook delivery in Limpopo since the beginning of the year, following the Supreme Court of Appeal judgmentin December 2015. The judgment confirmed that each learner in the province has the right to a textbook, for every subject for which they are enrolled, by the start of the school year. We have received reports of thousands of outstanding textbooks, not only from learners who have not received top-up books as it has been claimed, but also from schools claiming that entire grades have not received textbooks for specific classes. Kgetjepe has consistently upheld, as he did in his budget speech, that all textbooks were delivered in time for the beginning of the school year, aside from a very small number accounted for by learner migration. However, it is difficult to reconcile this with the figures reported to BEFA and SECTION27. We also cannot claim that every learner has all of their textbooks until all Curriculum Assessment Policy Statements (CAPS) curriculum textbooks have been adapted to Braille for visually impaired learners. There have been plans for this production for years now and yet not a single CAPS textbook has been supplied to visually impaired learners. We cannot blame a dramatic increase in the number of underperforming schools and substantial decline in the province’s matric results on the difficulty of the examination papers, as Kgetjepe did in his speech. We cannot expect to see results when learners are taught in dilapidated classrooms crawling with snakes and other reptiles, with insufficient furniture and sharing textbooks. We cannot expect to see results when learners fear or avoid going to the toilet in schools. Learners are not receiving the quality of education to which they are constitutionally entitled, and it is time for the Department to act. Kate Paterson is an attorney at SECTION27. Her core area of focus is on the right to basic education.